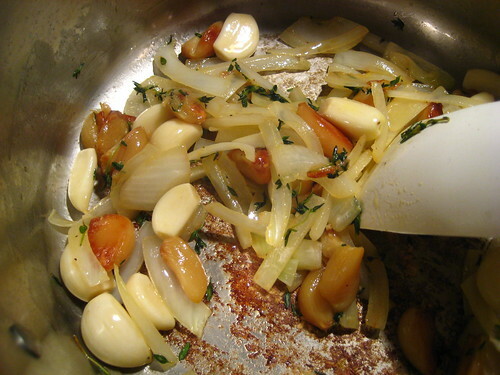 When my mom first started teaching me to cook, each dish started with garlic. 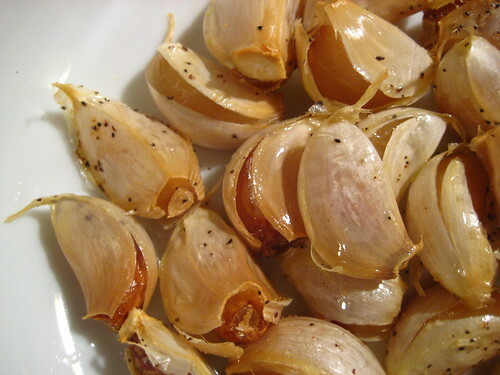 It's a base ingredient for most Filipino foods, and it's become second nature for me to add three to five cloves of garlic to most everything I cook. 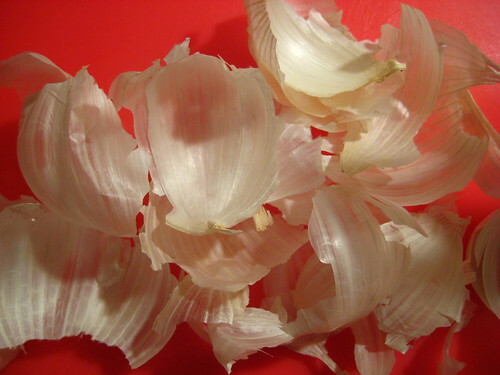 Garlic is also the best way to get Murdo to eat anything. He's one of those "there-can-never-be-too-much-garlic" people, who thinks adding more garlic to anything instantly makes the dish better. 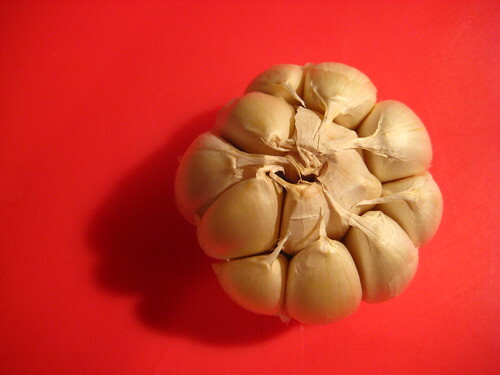 Which I don't agree with -- there can certainly be too much garlic sometimes, and I've come to hate having a garlic taste (and offensive breath) linger in my mouth for days. So when I found a recipe for 44-clove garlic soup over at Smitten Kitchen, it was mainly for Murdo that I decided to try it out. A new year, a new recipe, a chance to use the stick blender that I got for Christmas, and enough garlic to ward off a whole year's worth of vampires (which is obviously the second reason why I made this soup -- to keep bloodsucking demons away in 2009). But I'll be perfectly honest with you: I was a little worried. About how strong the soup might turn out and how forcefully the smell of garlic would cling to the apartment walls, the apartment building, my hair. But what the hell; let's start off the new year with a little adventure. And stank. Oh my. This soup is effing garlicky. Served over a pile of shredded Parmesan cheese and squirted with a lemon wedge, the first taste was definitely a mellow mingling of flavors and textures that I did enjoy. But as we kept eating, the soup just kept getting more and more garlicky. 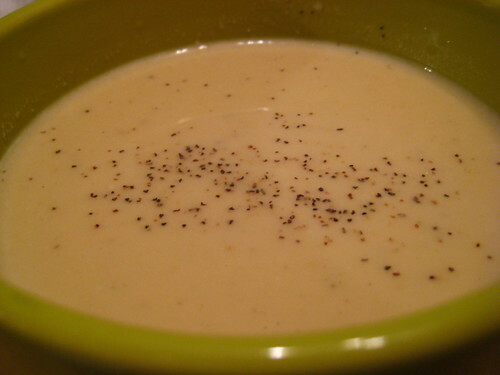 A subtle garlicky, but still, there was no getting around it -- this was roasted garlic soup, and each spoonful reminded me like a slap on the wrist that I was the fool who decided to make a soup with 44 cloves of garlic in it. What was I thinking? This soup will forever be the dish that brought Murdo to utter the words, "There is such a thing as too much garlic." Don't get me wrong -- it wasn't inedible by any means. But neither of us finished our bowls. And I won't be making it again. But what does this mean for the new year? Am I destined for disappointment in 2009? No. Because I certainly don't regret making this soup. It was actually kind of fun -- roasting the garlic, and squeezing them out of their skins, and knowing that while such an obscene amount of garlic could freak a lot of people out, I remained unafraid. Besides, I wasn't really expecting a soup that would knock my socks off. I was just curious, that's all. So maybe that means it will be a year of satisfying curiosities. Of taking risks. Of sitting back and enjoying the journey, even if the destination is a little less than wow. That first picture is AWESOME. Love the red! Thanks for "friending" me on Foodbuzz. Last spring, I tried something called Garlic Soup primarily for the curiosity factor. 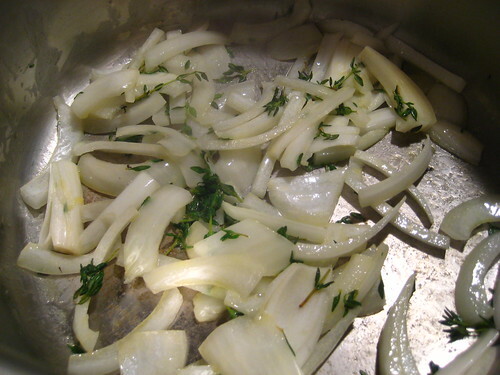 It used something like 5 or 6 heads of garlic. I was also one who felt that one cannot have enough garlic (like your M). Seriously, the soup burned my mouth to eat it it was so strong. I only ate about 1/2 cup, but the odor seeped out of my pores for days after that. Yes, I agree with you, there is such a thing as too much garlic. Interesting experiment--maybe it could be turned into a sauce for chicken or shrimp? shanna - thank you! the cooking process was fun to photograph. the outcome...not so much. it's so hard for me to find good lighting in my apartment! joie de vivre - hey there, friend! good for you for giving in to your curious hunger. it's the best way to try new things. and see, we've both learned something valuable about garlic. as in, stay away from garlic soup! mrob - it certainly was interesting and fun. but i don't think i'll be coating anything in this stuff anytime soon. but speaking of shrimp...i could go for some right now. chichajo - yes, no vampires coming my way! hi gaga! keep me updated if you do decide to try it. i think another main problem with this soup was that we only had it with a salad. 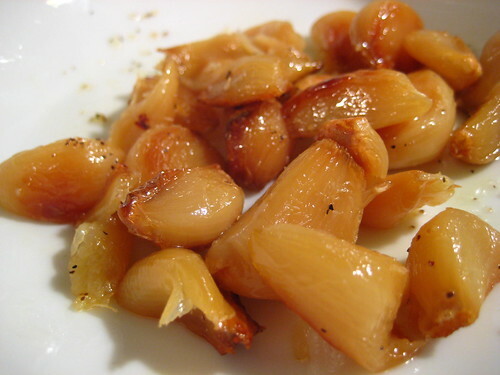 maybe served with some crusty bread and a heartier main dish would would help balance out the garlic a bit more. Sorry you weren't quite pleased with the final result, but it's great you've tried that recipe. I would have taken some of that cooked garlic and added it to mashed potatoes. olga - believe it or not, i'm not a huge fan of garlic mashed potatoes, either. man, am i just becoming some sort of garlic wimp? i hope not.